A British researcher has developed a new weapon in the fight against the MRSA "superbug" that affects thousands of hospital patients each year. The scientist - who works at Birmingham Heartlands Hospital - has developed a new test that should help doctors identify the bacterium more quickly. 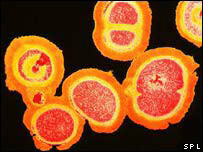 MRSA is resistant to nearly all antibiotics, with screening of patients taking as long as two days. But the new test could cut that to two hours, helping to stop it spreading. The test can identify a particular strain of MRSA, giving a detailed picture of its genetic structure, which researchers say will make it easier to discover the source of the infection. But the test is regarded as expensive, costing £15 per patient. Current testing costs between £5 to £8. Professor Peter Hawkey, the researcher who developed the test, said: "By doing a test which takes two to three hours , it would be possible to release that patient, if they are not colonised [with MRSA], from isolation." The test has so far only been evaluated in the lab, so further research must now take place in a hospital before it can be decided if the test should be widely introduced. The National Audit Office estimates infections such as MRSA kill 5,000 people each year. Hospital-acquired infections cost the NHS around £1 billion a year. Meanwhile doctors and scientists from around the world are meeting at the Royal College of Pathologists in London for a major conference on tackling hospital-acquired infections like MRSA. Health Secretary John Reid, speaking at the conference, announced the results of the second round of equipment, materials and products which could help NHS staff improve infection control in hospitals. Delegates will also discuss how the government's £3m budget for research into MRSA should be spent. Last month, Mr Reid announced radical targets for MRSA, demanding the number of bloodstream infections be halved by March 2008. The Health Secretary told the BBC: "I said we would leave no stone unturned in the fight against the superbug and, so far, we have introduced a whole series of steps to do with cleanliness and design and separation in single rooms and hygiene and so on. "But we have to marshal science as well." Shadow Health Minister Simon Burns said: "Infection control nurses have said they want less expert advice but independent authority to shut down infected, dirty wards. "Whilst action is needed to stop 5,000 people dying every year, John Reid chooses to hold another meeting to talk - again - about what to do. Less talk and more action is urgently needed to tackle the MRSA hospital superbug." Paul Burstow, Liberal Democrat health spokesman, added: "The government talks tough on superbugs but its record on tackling hospital infections is sadly lacking. "The government has to adopt a zero tolerance on poor hygiene and a search and destroy approach to tackling superbugs with robust screening and isolation."